Marantz SR7005 review | What Hi-Fi? 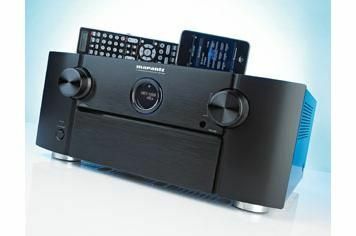 Kit-rack presence doesn't come much burlier or more intriguing than Marantz's strapping SR7005 multichannel receiver. This is the first time we've seen a home cinema amplifier fitted with a monocle, for starters. That circular, watchcase-like display is a lovely design flourish, and there's a much more comprehensive display hidden behind the fascia flap – like your fridge, it only lights up when the door's open. As befits a receiver at this price, the Marantz is creaking under the weight of its own specification. Eight HDMIs (six in, two out, all 3D-compatible), audio processing to accommodate surround rear, front height or front width 7-channel configurations, hardwired Ethernet networking ability and Apple AirPlay compatibility are among the highlights – the full list is exhaustive. The automatic, mic-assisted set-up, achieved via so-so on-screen menus and a so-so remote control, isn't the fastest, but is as accurate as any receiver we've used that isn't a Pioneer. Asked to decode, amplify and distribute the DTS-HD Master Audio 7.1 soundtrack to the Blu-ray reissue of Se7en, the SR7005 performs with a deal more brio than recent Marantz multichannellers. The soundstage isn't the most expansive, but rather an intimate, tightly unified circle, with effects steered securely and the feeling of immersion tangible. The SR7005 punches determinedly, with little slack at the beginning or the end of low-frequency hits or notes, and summons crisp attack at the top. Detail levels are high and dynamic headroom is considerable. It's a much faster listen than Marantzes of old – progress of which we entirely approve. It's the midrange, and consequently the centre speaker, that proves most problematic. There's an undeniable thickening of low-midrange/upper-bass frequency information, which stifles transparency and hampers dynamic subtleties. This rather muscle-bound approach to dialogue spoils an otherwise well-judged tonal balance and impacts negatively on the overall agility of the sound. Plus it leaves the SR7005 palpably more difficult to match to speakers than the best of its rivals. It's similar with stereo music, too: ample attack, decent timing and good focus, all undermined by a crisis of confidence a third of the way up the frequency range. But the fact remains that this is as exciting a multichannel amp as Marantz has turned out in ages, and one that's far more thoroughly specified too. With that system-matching caveat to the fore, then, it's well worth an audition.